Mezzo-Soprano Kristin Hoff debuted at Carnegie Hall singing Elliot Carter’s Syringa with Maestro James Levine conducting. She has been a soloist with the Boston Pops Symphony Orchestra, the Vancouver Symphony Orchestra, and the Montreal Symphony Orchestra, among many others. Kristin’s operatic roles include Anna Maurrant, Tebaldo, Princess Eboli, Ottavia, Marcellina, Prinz Orlofsky, Donna Elvira, Mrs. Anderssen, Nancy, Mrs. Herring, Carmen, the Mezzo-Soprano in Claude Vivier’s Kopernikus, and Dryade in Ariadne auf Naxos at Tanglewood with conductor Christoph von Dohnanyì. 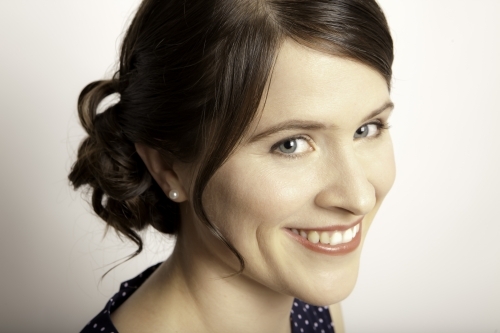 Ms. Hoff won the Prix Lyrique Allemand at the 2010 Gala Concert of the Jeunes Ambassadeurs Lyriques du Canada and was awarded a concert tour in China in the 2014. She was chosen as a Caramoor Vocal Rising Star for 2012 and sang also as a part of the New York Festival of Song, about which the New York Times referred to Ms. Hoff as a « Mezzo-Soprano whose voice has both body and beauty ». Kristin recently performed Ana Sokolovic’s Love Songs with the Festival de Lanaudière, the Kitchener Open Ears Festival, and in Montreal, Toronto, and Vancouver. She will perform this one-woman opera at the Musée des beaux-arts in Montreal in April 2015. Ms. Hoff is a recent 1st prize-winner in the NYCO Mozart Vocal Competition. Recently she appeared in recital with Music Niagara, the Vancouver Island Chamber Music Festival, the Qualicum Beach concert series, the Silk Purse concert series, among others. In September 2013, Kristin joined Vancouver Opera as a resident young artist and performed the role of Tebaldo in Don Carlo and covered Eboli, Nancy, Mum and Donna Elvira for Vancouver Opera’s main-stage season. Kristin recently debuted with the Vancouver Island Symphony Orchestra and the Palm Court Light Orchestra. Kristin will also perform Messiaen’s Harawi at the Chapelle Historique du Bon-Pasteur this spring, as well as Mendelssohn’s 2nd Symphony with the Vancouver Symphony Orchestra.